Description Scanned image of a drawing of bronze and bone pins from excavations by Sir Francis Tress Barry and John Nicolson at Nybster and Ness brochs. Bronze pin from Ness broch annotated with museum accession number 'GA747'. Provenance of bronze pin is given as Nybster broch but there is a contradictory note that attributes it to Ness. Scope and Content Watercolour of bronze pin and bone needles from brochs, Caithness, Highland There are a considerable number of brochs on the north-east coast of Caithness, many of which were investigated by Sir Francis Tress Barry (1825-1907), who purchased the Keiss estate in 1881. Between 1890 and 1904, Barry spent his summer months excavating as many as 25 sites, including a number of brochs. This watercolour by John Nicolson (1843-1934) shows two views of a bronze projecting ring-headed pin (left) and two bone needles of Iron Age or Early Medieval date. The bronze pin would have been an important decorative item at the time and would have acted as a clothes fastener. This drawing illustrates the importance of Nicolson's drawings in understanding the provenance of objects. 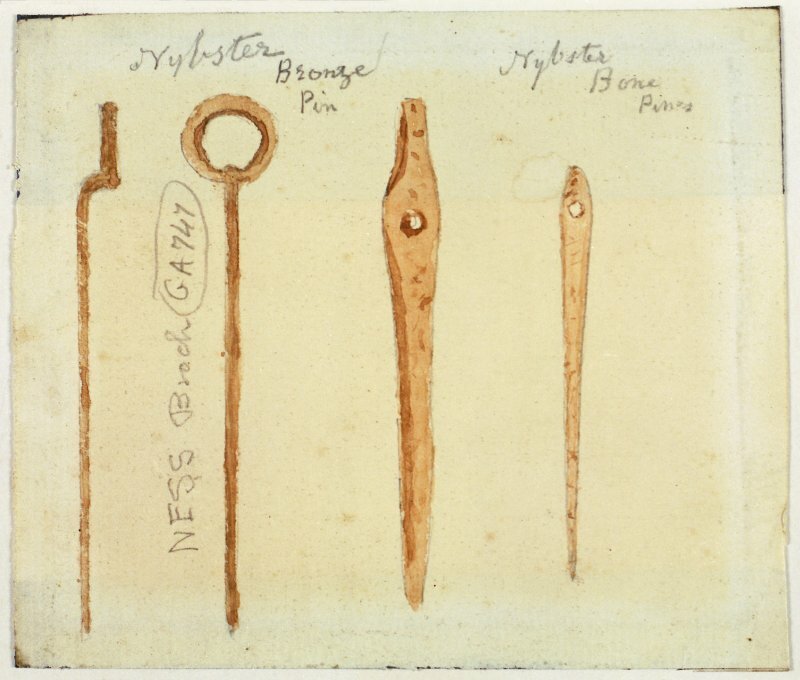 Whereas the notes state that all the pins were recovered from Nybster, later records claim that the bronze pin was from the nearby broch site of Ness and one of the bone needles was from Everley broch. It is possible that Nicolson's drawings give a more accurate indication of the provenance than originally thought. Source: RCAHMS contribution to SCRAN.